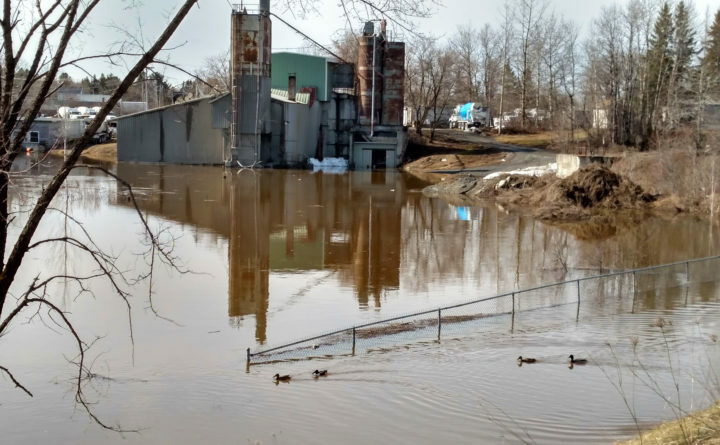 An overflowing Presque Isle stream covers the grounds of the Trombley Redi Mix plant on Dragon Drive on Friday morning, April 27, as four ducks investigate the larger water mass. CARIBOU, Maine — A flood watch remained in effect for all of northern Maine Friday as meteorologists at the National Weather Service in Caribou continued to be concerned about rain and high temperatures. Joe Hewitt, meteorologist for the NWS, said Friday none of the major waterways, including the Aroostook River at Washburn and Masardis and the Fish and St. John rivers in the St. John Valley, had overflowed their banks yet. But rain and melting snow remain a concern, he said, especially since some smaller streams and brooks had already flooded. Rising water levels on Madawaska Stream isolated some people in Westmanland Friday, leading game wardens to use a Maine Warden Service airboat in the afternoon to evacuate one woman from her home. They used the airboat to bring supplies to others in the area after the flood waters made Little Madawaska Lake Road impassible. Heavy rain and rapidly melting snow on Thursday caused streams, brooks and culverts to overflow, shutting down a number of roads in The County, including Henderson Road west of Easton and Currier Road in Fort Fairfield. The weather service had issued a stronger “flood warning” for northern Maine on Thursday but reduced it to a lesser “flood watch” by Friday morning after the rain tapered off. The flood watch for all of Aroostook County and northern sections of Penobscot and Piscataquis counties is in effect through Saturday afternoon with the potential for culverts and ditches to fill up and minor flooding of roads to occur. Darren Woods, director of Aroostook County Emergency Management, said Friday that he has gotten reports of rivers, lakes and streams swelling from Oakfield to St. Francis, and expected them to continue rising throughout the weekend. Several rivers in The County were at “action stage” levels, meaning at a place where water is just below their banks. The Aroostook River at Washburn was running at 12.21 feet at 11:30 a.m. Friday, with flood stage being 14 feet. The Aroostook River at Masardis was running at 16.09 feet, with a flood stage at 17 feet. The Mattawamkeag River at Mattawamkeag was experiencing minor flooding by Friday afternoon, having reached 14.36 feet with a flood stage of 13.5 feet. Canadian officials were worried about St. John River water levels rising “faster than normal” around Fredericton on Friday, pushing the river past the flood stage, according to CBC News. Water levels were at about 25.5 feet in the capital city of New Brunswick, a few feet above the flood level of 21.3 feet. In Aroostook, Woods said that while minor flooding was expected in areas that typically flood, such as the Fish River in Soldier Pond and Wallagrass, his office was not as concerned about the U.S. side of the St. John River. At that time it was below action level at 19.35 feet with flood stage at 22.5 feet. According to Hewitt, rain is likely Friday night and Saturday, with potentially a quarter-inch of precipitation falling in that time period. In several spots around Aroostook County, residents Friday were dealing with water in their basements, including in Houlton and Madawaska. Janice Henderson said that she and her husband spent the morning pumping “a couple of inches of water” out of the basement of their Houlton home. Hewitt warned the public to stay away from streams, even if they appear to be still or slow moving.